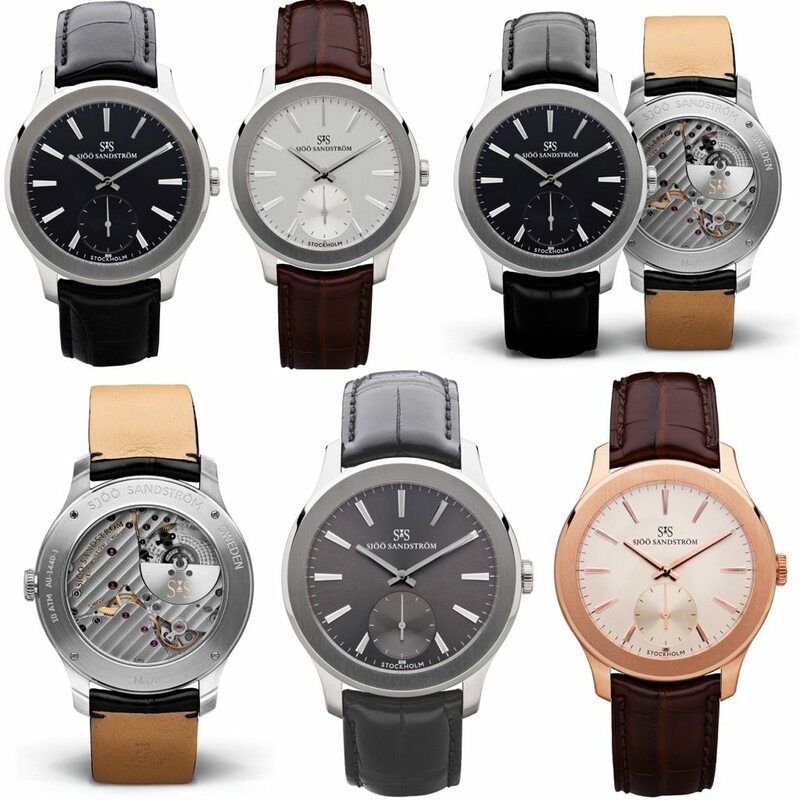 The last time I was talking with you about Swedish watch brand Sjoo Sandstrom, we were going over what I consider to be an entry-level model out of their collection, the Sjoo Sandstrom Royal Steel Classic. In that article, I positioned the watch as one that sits on the dressier end of the sporty spectrum. Well, the watch we’re talking about today, the Sjoo Sandstrom Royal Capital, flips things around a bit, as I’d say it’s more on the sportier end of a dress watch. That is not to say the Sjoo Sandstrom Royal Capital is a small watch. Well, perhaps by modern standards 40mm is small, but I call it comfortable wearable. No, with the Sjoo Sandstrom Royal Capital, what brings me to call the watch a dress watch is due to the finishes, as well as another dimensional aspect (which we’ll get to in a minute). But first, those finishes. Take a close look at the indices and handset. Notice anything missing? That’s right, no lume. When I see that, I immediately put a watch into a dressier category. Subtract the luminous paint, add in beveled and polished surfaces on those hands and indices, and yeah, you’ve got a dressier piece. Now, on a dress watch, you’d commonly expect the bezel to be polished. Not so here. Instead, the Sjoo Sandstrom Royal Capital features a brushed bezel. This is set within a polished case, so you do get a bright ring around the bezel. However, with the brushing, it catches and mutes the light much differently and – at least in the photos – makes for a darker look. This is a great example of how the brand is mixing up the design a bit, and it’s a detail that I rather like. The dial of the Sjoo Sandstrom Royal Capital carries along that flatter look, which helps to offset the bright indices (and hands) as well as the glossier small seconds sub-dial. Mix in an alligator strap and deployment clasp, then, yeah, you’ve got yourself a dressier sort of a watch. And, if seeing it in steel and sapphire (both front and back) isn’t dressy enough for you, there’s also a variant with a 18K pink gold case. As I mentioned at the outset, there’s a dimension of the Sjoo Sandstrom Royal Capital that also points to it being a dress watch, and I meant that literally. In this case, it’s the case thickness – here, it’s called out as 7.8mm. Now, we’ve seen and read about thin watches before, but flipping the watch over reveals why this is special – at least for me. You see, the Sjoo Sandstrom Royal Capital features a movement with a micro-rotor. The movement, in this case, is labelled as a SSG9, which is based off of the Vaucher Manufacture Cal. 5401. AKA, not some no-name movement. Ever since I have learned about them, micro-rotor movements have fascinated me. It’s a clever way of simplifying a watch (making it thinner) while, at the same time, making the mechanicals more complex. The off-center mounting needs to be accounted for and power transmitted to the barrel. With the smaller rotor, how do you ensure there’s enough energy being transmitted? That part is simpler – the micro rotor is made from tungsten. Suffice to say, I rather like micro rotors, though I’ve never actually seen or handled one in person. Ah, well, some day. Caliber reference: SSG9 (Vaucher Manufacture Cal. 5401). Thickness: 2,6 mm. Energy: Automatic. Rotor: Micro rotor, Tungsten (Wolfram). Jewels: 29. Number of pieces: 146. Frequency: 3Hz (21’600 v.p.h). Power reserve: 42h. Indications: Hour, minute and small second. CASE – 18K 5N pink gold, Ø40mm, thickness 7,8mm. CASE-BACK – 18K 5N pink gold, see-through with sapphire crystal. GLASS – Scratch resistant sapphire crystal with anti-reflective coating. BEZEL – Brushed 18K 5N pink gold. BRACELET – Brown genuine alligator bracelet with curved fitting. Folding buckle in 18K 5N gold with engraved logo. WATER RESISTANCE – 10 ATM (100m). CASE – Steel, Ø40mm, thickness 7,8mm. CASE-BACK – See-through with sapphire crystal. BRACELET – Black/Grey/Brown genuine alligator bracelet with curved fitting. Folding buckle in steel with engraved logo. Previous articleOrigin Watch Co. Vintage Field asks: Shinola who? Looks nice. I would pay this kind of money for a JLC, not for this brand. Ugly logo. The watch has no date window.